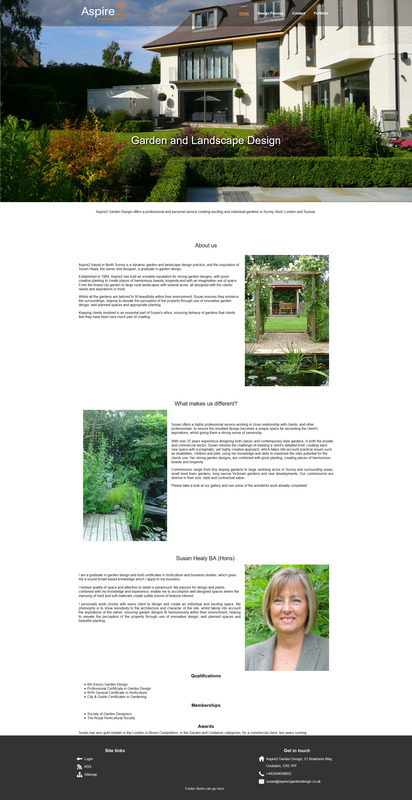 Aspire 2 Garden Design are a company based in Coulsdon near Croydon in Greater London providing high end landscape and garden design services. They decided to move to us when hotchilli their original web hosting provider suddenly closed down, giving them less than a months notice. As the site was starting to get a little dated, we agreed that a slight re-brand would help them stand out, and as a competitor had a site they quite liked, we would use some of the concepts from that site. The site is hosted on our Ousia CMS platform, so they benefit from all of the enhancements available and can update the site as and when they require to save time and costs. After only two months business has more than doubled with my new website, with enquiries pouring in. Thank you, Claytabase. Having you build and host my new website was a great decision, I am really delighted with it.